That’s exactly what we did. And sure enough, it wasn’t long before our kids—Alan, Emily and Eric—were tunneling through the bushes to see what was happening at the Kenerlys. 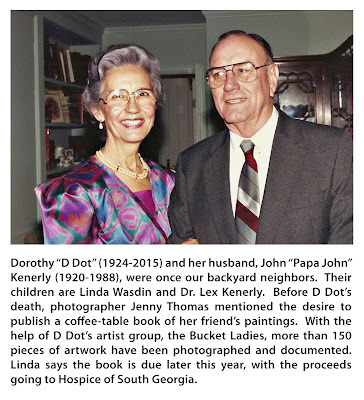 There were always happenings at Papa John and D Dot’s. Their workshop was a wonderland of activity to behold. People came from far and wide for the husband-and-wife team to fix this or restore that. Skill, creative genius and the patience of Job, made magic happen in the tiny structure where the lights often burned until bedtime. Time after time, I witnessed a dilapidated pie safe or such of some granny turn into an heirloom coveted by everyone in a family. Papa John and D Dot had a knack for making treasures out of stuff most folks would call junk. Come to our house. We’ll show you. There’s not a room which doesn’t have proof of their handiwork. As gifted as they were with their minds and hands, the Kenerlys had another talent which you can’t buy even from Amazon. They had perfected the art of Southern hospitality. The invisible welcome sign was always on, and people knew it. Heirlooms don’t have to be exquisite vases, ornate tapestries, or armoires brought from the old country by your long-since-departed kin. Our ancestors didn’t have any expensive items to pass down to us, but D Dot and Papa John certainly made so many of our hand-me-down items priceless for our family. That’s why I believe gold-plated memories, the kind the Kenerlys gave us, are heirlooms, too. Money has its importance. Life is expensive—food, clothing, shelter, medicine, education and transportation. You know that never-stops-growing list. And if there’s money left after the monthly obligations, recreation is more than a frill. It’s a medicine of its own. But when that day comes, and we are looking back, I don’t believe our checkbook balance will really matter. Our true wealth will be measured not by monetary standards but by those who have lovingly enriched our lives: family and friends. Yesterday, I paused to look at one of D Dot’s oil paintings. Papa John had made the tobacco-stick frame. Thirty years have passed since I ducked through the red-tip tunnel with a picture which I wanted D Dot to re-create on canvas. 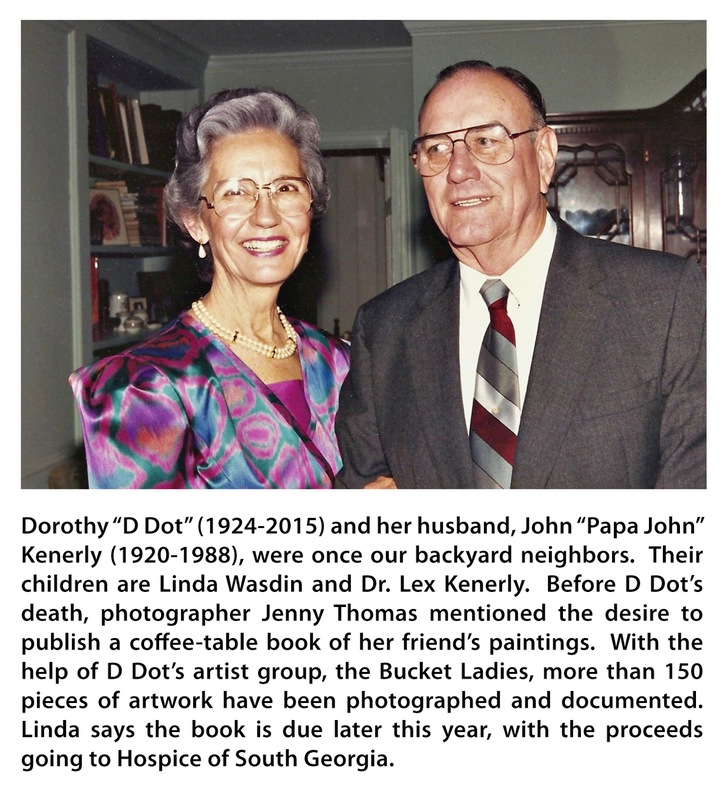 As I stared at the scene, I remembered holding D Dot’s hand a few days before she went to heaven to join Papa John. We both knew it was a goodbye visit, so we retraced our favorite heirloom of backyard-neighbor memories. Ahhhh, those are things which a warehouse of $100 bills cannot buy.